Summary: Explains how admins can use the Office Deployment Tool or Group Policy to configure update settings for Office 365 ProPlus. 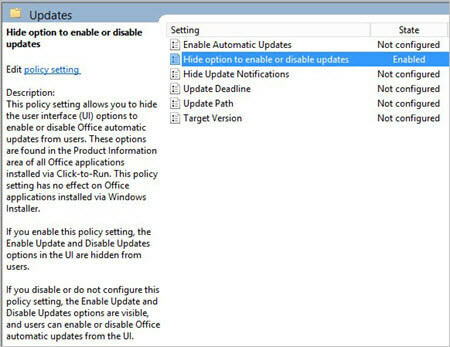 Here are the update settings that you can configure by using the Office Deployment Tool or Group Policy. You can't configure this by using the Office Deployment Tool. By default, updates for Office 365 ProPlus are downloaded automatically from the Internet and applied in the background, without any user or administrator intervention. You can use these update settings to change that behavior and make other changes about how Office 365 ProPlus is updated. In most cases, you'll use either the Office Deployment Tool or Group Policy, not both, to configure update settings. If you do use both to configure a setting, the Group Policy setting overrides the setting configured by the Office Deployment Tool. Users can install Office 365 ProPlus themselves from the Office 365 portal, but using the Office Deployment Tool to deploy Office 365 ProPlus to your users gives you more control over the installation. This includes controlling how Office 365 ProPlus is updated. The settings that the Office Deployment Tool uses to install and update Office 365 ProPlus are contained in a configuration.xml file. This file is a text file that can be edited in Notepad. There is a list of settings that you can specify, including settings for configuring updates. The update settings in the configuration.xml file are applied to Office 365 ProPlus when you use the Office Deployment Tool to deploy Office 365 ProPlus. If you decide to change these settings, you must update your configuration.xml file, and then run the Office Deployment Tool again. If you have Windows Server and Active Directory Domain Services (AD DS) deployed in your organization, you can configure update settings for Office 365 ProPlus by using Group Policy. To do this, download the most current Administrative Template files (ADMX/ADML) for Office, which include the policy settings for Office 365 ProPlus. You must be running at least version 15.0.4605.1003 of Office 365 ProPlus, which was released in April 2014, to use the following policy settings: Hide update notifications, Target version, Update deadline, and Update path. To determine which version of Office 365 ProPlus is installed on a user's computer, go to File > Account in any Office program. The version is listed under the Office Updates section. After you copy the Administrative Template files to AD DS, you'll find the update policy settings under Computer Configuration\Policies\Administrative Templates\Microsoft Office 2016 (Machine)\Updates in the Group Policy Management Console. You'll also find a description of how to configure each policy setting. If you decide to make a change later, update the Group Policy setting by using the Group Policy Management Console. The updated policy settings are automatically applied to Office 365 ProPlus, through the normal Group Policy update process. Group Policy settings can be used regardless of whether users install Office 365 ProPlus themselves from the Office 365 portal, or if you deploy Office 365 ProPlus to your users by using the Office Deployment Tool.